The Chronology program is devoted to the theoretical study of how events are arranged chronologically and how to work with the timeline. 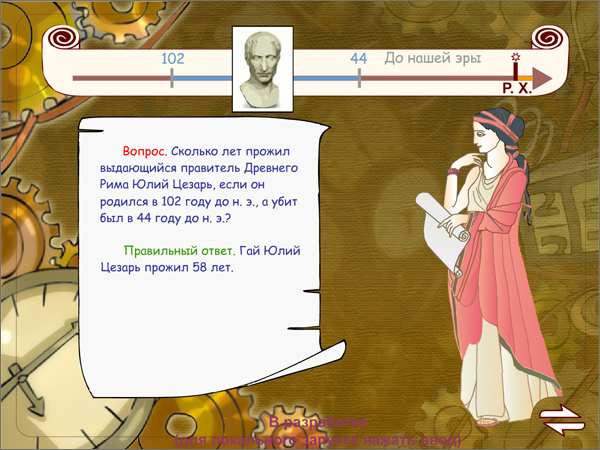 Here, pupils will get acquainted with the main concepts of time (day, month, year, etc.). The timeline will help them to determine the century corresponding to the year, write it down in Roman numerals, and estimate the duration of events if they occurred before our era (B.C.) or in our era (A.D.). The narrators in the program, the muse of history, Clio, and the muse of astronomy, Urania, are happy to share their knowledge. 1. "Chronology". Here, pupils will study the development of calendars from the antiquity to our days and will master the skill of working with historical dates and events. While working on practical assignments of this unit, pupils are requested to formulate the rules of working with the time line in order to check their comprehension of theoretical material. Date of the event, A.D.
Sequence of events before our era, B.C. Duration of events before our era, B.C. Date of the event, B.C. 2. "12 Months" is devoted to revision of the sequence of months in a year. 3. 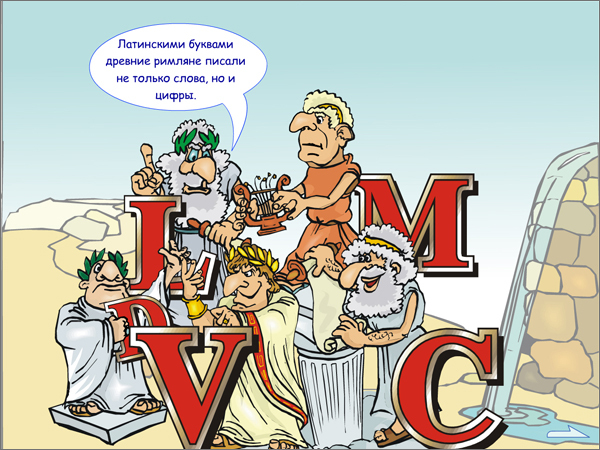 "Roman Numerals" is devoted to studying the use of Roman numerals in everyday life and mastering the skill of converting Arabic numerals into Roman ones and vice versa. 4. "Calendars of the Past" gives an idea of the Julian calendar used in ancient times. These sections can be used as additional material for explanation, depending on pupils' age and academic background. "12 Months" will be useful for beginners, while "Calendars of the Past" may be interesting for the most inquisitive and successful pupils. A separate block is training pupils to work with dates and events belonging to different historical periods, related to famous discoveries, inventions and personalities. Completion of these assignments is monitored by the computer. In case of an error, a hint - a rule on how to make calculations - is displayed. The pupil is given two attempts to solve the problem. Assignments presented in this block differ from those in the theoretical section - they are supplemented with more difficult and challenging tasks, such as: define how much time passed from one event to another. This type of tasks requires retaining two dates in memory, both of which may be presented either in Roman or Arabic numerals, and is devoted to pupils of a more advanced academic level.